At this morning’s Spring Forward keynote event, Apple unveiled a brand new line of 12-inch retina MacBooks. Apple is calling this a “reinvention” of the notebook computer, a claim that is evident in every aspect of the new Mac’s composition. The all-new notebooks are a mere 13.1 mm thin, and weigh in at just 2 pounds. Their 12-inch retina display has a resolution of 2304 x 1440 pixels, and at 0.88 mm thin, it’s the thinnest display ever included on a Mac. It also has a 16:10 aspect ratio and a 178 degree viewing angle. According to Apple, they have increased the size the aperture on every pixel on the display, boosting the new Mac’s energy efficiency by 30% while still maintaining the same level of brightness. The keyboard has seen a complete redesign as well. While traditional keyboards (including Apple’s) use a scissor mechanism under each key, the new MacBook’s keys are built on top of a unique, Apple designed “butterfly” mechanism, making each key press completely stable regardless of whether the force of the press is skewed to one side. This approach also allows the keyboard to be much thinner than existing keyboards on MacBooks Air and Pro. In order for the 12-inch MacBook’s keyboard to remain full size, it stretches to the very edge of the device on either side. The backlight for the keyboard has been redone as well, leaving behind the old LED row and light guide panel in favor of individual LED lights under each key. The most obvious change when using the new MacBook will be the redesigned Force Touch trackpad. Another casualty in Apple’s ruthless quest for thinness is the trackpad’s clicking mechanism. On the new MacBook, the trackpad will not actually depress. Rather, it employs Apple’s “Taptic” feedback engine, the same technology being used in the Apple Watch to “tap” you on the wrist when it wants your attention, to simulate the feeling of clicking. The strength of this feedback can be configured via software on your Mac, so if you want a stronger or weaker “click” from your trackpad, you can adjust that to exactly how you like it. The trackpad’s new name comes from the second new technology implemented in it: Force Touch (in use on the trackpad Apple refers to it as a Force click). We also heard about this first in the Apple Watch announcement last fall, and true to its name, a Force Click is a press on the trackpad with more force than that used in a standard click. This is basically being used as a new type of gesture that OS X can detect. It has a variety of uses, such as defining words, opening maps, and previewing files. 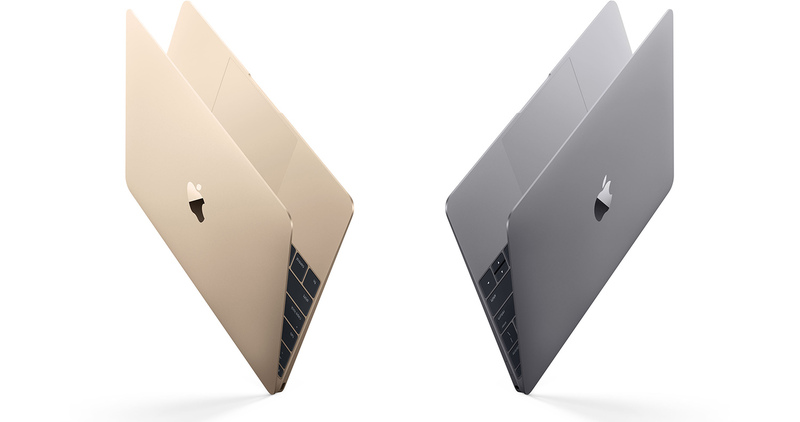 Apple’s new MacBook packs a fifth-generation Intel Core M processor, which runs at only 5 watts. It is the first Mac notebook ever to be built with a fanless architecture, a feat achieved thanks to the low power processor and a hardware design that disperses any heat generated out through the sides. The logic board has been miniaturized based on techniques learned from building iPhones and iPads, resulting in Apple’s smallest and most dense Mac logic board ever. The space freed by reducing logic board size has all been filled with battery, so not surprisingly, the new Mac has an incredible 9 hours of battery life for web browsing, and 10 hours for movie playback. One of the most polarizing features of the new MacBook is Apple’s decision to throw out every port except for the headphone jack and a new USB-C port. The USB-C port is extremely versatile, allowing charging, USB 3 data transfers (5 Gbps), and video output supporting HDMI, VGA, and Mini DisplayPort. The new connector is a third the size of the current USB connectors in other Macs, and is reversible. Apple’s new MacBooks come in two base models, one at $1299 (1.1 GHz dual-core with Turbo Boost up to 2.4 GHz, 8GB RAM, 256GB flash storage) and one at $1599 (1.2 GHz dual-core with Turbo Boost up to 2.6GHz, 8GB RAM, 512GB flash storage). These new notebooks only add to Apple’s MacBook lineup, the current MacBook Air and MacBook Pro models will continue to be sold, and saw a small refresh at todays event as well. The all-new MacBooks will begin shipping on April 10.